When visiting Ireland last summer, I knew that we would be doing a lot of driving from town to town so I packed my iPod full of songs that carried a similar theme. It was mellow, thought-provoking music that had stories to tell. Like I’ve previously mentioned in my Belize Playlist post, I carry an iPod Shuffle when I travel because it’s super light, is only $49, and can hold hundreds of songs. Mine in particular is pink but I’m positive that they have multiple colors you can chose from. When it comes to songs that I will want to listen to, I’m all over the map. So this playlist is a bit eccentric. I tried to stay within a general theme but it got a little skewed. It happens. I know that “The Parting Glass” by Cara Dillon is an Irish song often sung at local pubs and it’s beautifully recreated every time you hear it. It’s often done in a slow, melodic whisper and there have been times I’ve heard it done in an almost thunderous way, showing jubilation. Regardless, it’s a beautiful song. 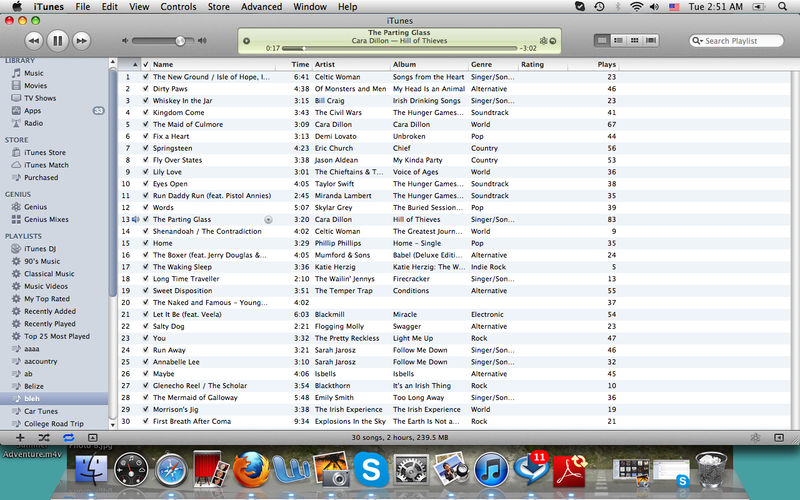 So, without further ado, here’s the 30 songs that composed my Ireland Playlist!